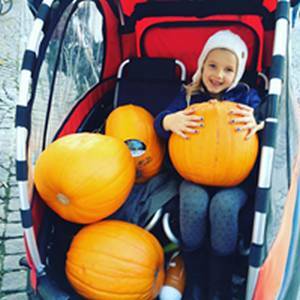 Children, pumpkins or both, what a great way to travel with cargo around the city! Our three wheeled trikes from Winther have many advantages for winter transport. The broad 1.75″ section tyres are very grippy and with three wheels the handling is confident even in wintery weather. Without the need to balence the bike, full attention can be given to the road and your children. The cabin can be sealed from wind, sleet and rain and with blankets for the knees, a cosy, fun, sociable time can be had on the school run, trip to the shops or round to grandma’s. The rider, whether you have decided on motor assist or not, will benefit from a raised heart rate, an easy work out taking up travel time rather than precious leisure time. By bike your journey times are predictable, with few parking problems and a tangible connection with your surrounding community. Your children are constantly in sight and communication is easy through the rear cabin window. We have chosen to stock and sell the Danish built Winther trikes due to their uncompromising attention to design and performance detail. The ease of use and ride quality is down to their active steering geometry, precision of manufacture and low centre of gravity. With three different models, each available with electric assist we consider them great value for money and a great way of getting around our city.